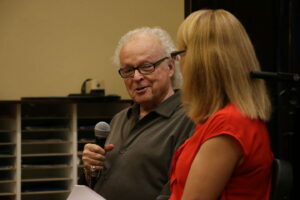 Musician Ron Oates giving advice to students at Saint Mary-of-the-Woods College on Oct. 2. A gifted all-around musician who has an impressive list of hit records with some of music’s biggest names shared some words of wisdom with students at Saint Mary-of-the-Woods College during his visit Oct. 1-3. “Never let that fire in your belly go out,” Ron Oates told music and music therapy students during an event in the Conservatory of Music building. Oates, the musician behind multiple gold and platinum albums, gave the students a realistic view of the music industry but asked them not to be discouraged. 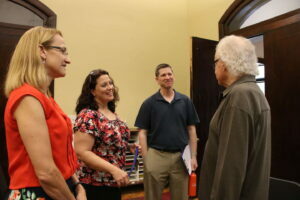 Music and theatre department faculty members talk with Ron Oates after his presentation at SMWC. “Invariably, the yes comes along …and it changes your life,” he said. 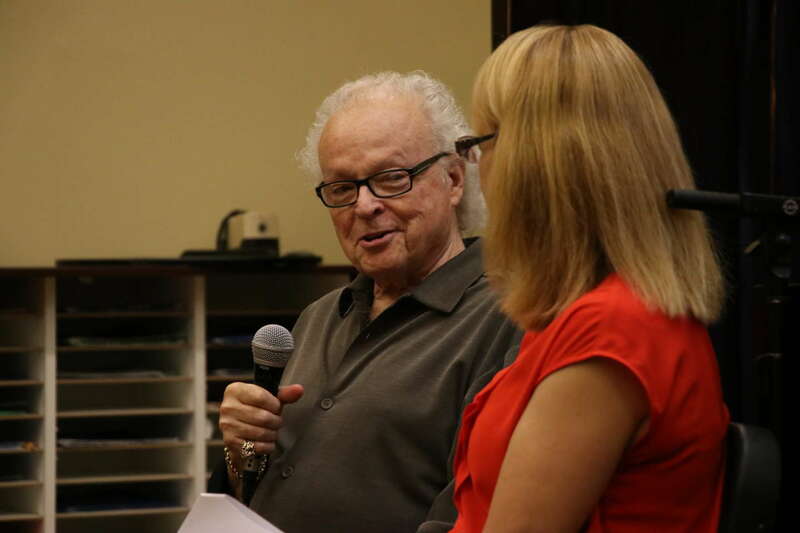 A nearly 50-year veteran of the Nashville music industry, Oates has played piano on hundreds of hit records between 1970 to 1990 and has worked with artists like Dolly Parton, The Oak Ridge Boys, Olivia Newton John and Gladys Knight. His musical mark is behind America’s famous commercials such as Wendy’s “Where’s The Beef?” and jingles for Kraft, Miller Beer, McDonalds, Burger King, RC Cola (Me and my RC), 7-UP, among many others. Music and music therapy students and faculty listen to Ron Oates share his experiences in the industry at an Oct. 2 event in the Conservatory of Music at SMWC. On Oct. 2, the songwriter, session pianist/keyboardist, arranger and producer answered students’ questions submitted in advance to Tracy Richardson, Ph.D., chairperson of the music and theatre department. He spoke about his musical training, his time in the U.S. Navy Band, and his move to Nashville where he caught his first big break. Richardson says Oates’ focus in recent years has been on artist development. Oates also gave advice to students intending to pursue specific careers in the music industry. For example, he said a college degree and an internship are necessary for students wishing to become a sound engineer. Studio experience is important, he added. The SMWC music and theatre department offers music technology classes. During his time at The Woods, Oates also spoke to students in songwriting classes. Richardson says Oates’ visit was an opportunity for students to understand his journey and learn about the music industry. She met Oates at a songwriting conference in Nashville. Both are piano players. “Thanks so much for inviting me to come speak to the students! 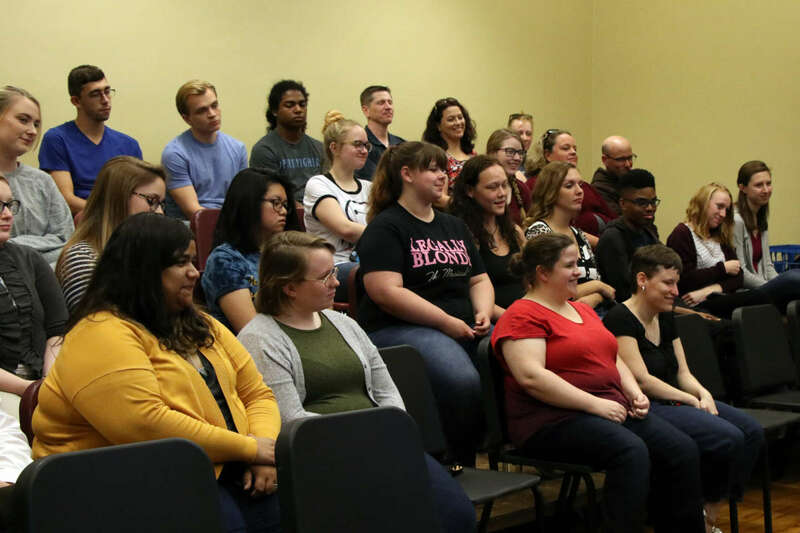 It was a marvelous time, and I hope to do it again sooner than later,” Oates wrote on SMWC Music and Theatre Department’s Facebook page.